There is a reason the nickname of Chris Bertolami is "the magician". He gets the job done, on time and on budget, despite the unforeseen obstacles that inevitably arise. His unique blend of intense focus, attention to detail and ability to be flexible enables his success. Chris has character and integrity, and I'm so happy I chose him for my large renovation project. I was fortunate to meet Chris just as I was interviewing another contractor. I felt Chris treated my project as not just another job but he is clearly someone who was personally interested in meeting my goals. On several occasions he went far and above duty and I always felt he was there to expedite my dream reconstruction. Everything works, everything is beautiful and almost three years later he would be there at a phone call. Cambridge Construction did my kitchen, wet bar and laundry room renovation last summer, along with the replacement of porcelain tile flooring with Crema Marfil marble. It was great working with Chris Bertolami and his staff. He was knowledgeable, infinitely patient with my indecisiveness, open to new ideas and sources and readily available on site. My building has very strict guidelines for construction season, and the fact that Cambridge has built a solid reputation and rapport with the managerial staff is a huge benefit to their clients as well. As you can see from the enclosed photo of my beautiful new wet bar, I get rave reviews from all who visit, and look forward to working with Cambridge on my next project! Cambridge remodeled our Kitchen and replaced our windows. Chris was a pleasure to deal with. It was great dealing with a contractor that actually calls back promptly. He kept me informed daily of what was going on with the job, who was showing up ahead of time. He stayed within budget. Hew was cost competitive. He stood behind his work 100%. It seems too good to be true when dealing with Chris. I highly recommend him and I am certain you will be pleased. I completely trust him to do the best job at the best price. So much that I have no need to ever call anyone else for work around my house. We had waited seven years to remodel our 1987 old kitchen and living area. Cambridge Construction transformed our house into a fabulous beachy casual home with the most fantastic restaurant ready kitchen. We are so proud of our kitchen that we're entertaining more than ever. During the construction my husband was away on business and Chris Bertolami, owner and GC, helped us create our vision. He went above and beyond the call of duty and even assisted me with the decorating of an oven hood, crown molding, color choices and even ordering pendant lights for the granite bar. From beginning to end the people involved operated with the highest degree of integrity and the price was right too. Cambridge Construction LLC build my salon located in Jupiter. They completed the job before the due date. They guaranteed their work, and all the work was done according to our specs. Chris (owner) has been very helpful. Even after the work was completed, Chris went out of his way to accommodate our special needs. I am very pleased with his work and very impressed with his company. I will definitely recommend Cambridge Construction to my friends and family. I used Cambridge Construction to renovate an old house. I can't say enough good things abouth this company. Every worker was a skilled professional, the owner, Chris was easy to communicate with and available 24/7, and they finished the project before expected. They did everything we contracted for and more. I am completely delighted with the way my house turned out. We hired Cambridge Construction to renovate our apartment after a flood destroyed all wood flooring throughout the apartment. There was mold under the wooden floor. The baseboards and the walls above were damaged by water and moisture. Bookcases and cabinetry throughout the apartment as well as all the kitchen cabinetry were built over the damaged and moldy wood flooring. Cambridge removed the old flooring and installed new porcelain flooring In all the areas where the old flooring had been including the areas under the cabinetry. The walls and cabinets and bookcases were all repainted. The building management had given us a limited amount of time to complete the work and Cambridge finished on time. Chris Bertolami, the owner of Cambridge was a pleasure to work with. He understood all the problems inherent in dealing with the damage caused by the flood and was able to complete the project without replacing or rebuilding any of the cabinetry. The quality of the work was excellent. We were beyond thrilled with the way everything looked. I'd like to mention in closing the review of Cambridge that when the insurance adjuster came after the work was finished, he thought that the kitchen cabinets were new. Everything looked so perfect that he couldn't believe that after all the damage and difficulty in replacing the floor, replacing baseboards, repairing walls, new electrical work, painting etc. that we did not have to replace all the cabinets. That was confirmation of how excellent the work was. Cambridge Construction work for us was as close to perfect as we could have asked for. We were thrilled. Thank you Chris! We hired Cambridge Construction upon recommendation from both the management office and other residents of our condominium community. Our kitchen remodel was to be done in our absence. Chris and staff guided us through the product selection process, took care of permitting, coordination with all subs, the ordering of materials, and execution of the entire job. We found the level of communication to be fluid and timely. Call were returned promptly and concerns or questions never put off, or on the back burner. Interaction with his staff and subcontractors was never a negative experience. We have been very pleased with the quality of the workmanship. We also appreciated his recommendations in areas where we could save money, without compromising quality or functionality. The job was completed in a timely manner, which is unusual for any construction project. We were a bit over budget, but the cost overrun was the result of my changing a few of the finish selections. Our project is complete and we are very very happy with the result! Would we recommend Cambridge Construction to others...most certainly. Would we use Cambridge Construction for a future project...definitely. As a Real Estate professional, I had the great opportunity to work with Chris and his team of professionals. I could not be more pleased with the outcome of my condo renovation. Chris is an absolute gentleman and his word is good. He was on the job everyday to follow up with the work done. He assisted me with renovation options, and gave me choices within my set budget. I absolutely would recommend Chris Bertolami and Cambridge Construction for any renovation large or small. n 2015 Cambridge Construction did the remodel of our condo to include impact glass throughout, a face lift in the kitchen, a complete renovation of the master bath, conversion of the guest bedroom to a study/office and new carpet. The project was done on time, on budget and the workmanship was excellent. The people who work for Cambridge as well as the subcontractors selected all provided quality results. Chris Bertolami, the owner, was extremely easy to work with and was available when necessary. We are thrilled with the outcome and would highly recommend Chris and Cambridge. 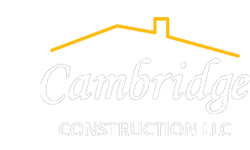 Cambridge Construction has worked on several projects for us over the past years. We've always been very satisfied with their professionalism and excellent execution. Chris does outstanding work and is a pleasure to work with. Using him was one of my very best decisions. Chris made all my renovation ideas and visions come to life! He was the perfect contractor for me - he was unflappable, no detail was too small and he always found a way to make things work or make them right in the rare event something wasn't up to his or my incredibly high standards. Above all, Chris is a very honest and decent man and was a true professional throughout.